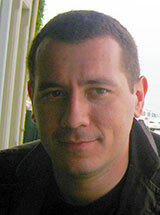 Keywords: chromatin, noncoding RNAs, epigenetics, Polycomb, ants. Epigenetics allows the inheritance of variation (phenotype) without changes in the DNA sequence (genotype). The fact that pluripotent embryonic stem cells, all sharing the same genome, differentiate into hundreds of cell types implies that information about cellular identity and transcriptional states must be stored somewhere within the cell but not in the primary DNA sequence. 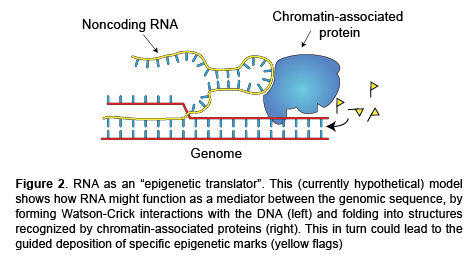 It has become apparent that this epigenetic information can be encoded in molecular signatures associated with chromatin, the complex of DNA, RNA, and proteins that packages the genome within the eukaryotic nucleus. These signatures include DNA methylation, histone “marks” and variants, higher-order chromatin structures, and chromatin-associated noncoding RNAs (Figure 1). The latter constitute the focus of our current research. A large fraction of the genome is transcribed into RNAs that, despite lacking protein-coding potential, perform important regulatory functions. Like proteins, RNA molecules can fold into complex tertiary structures with elaborate surfaces and cavities that mediate highly specific molecular interactions and even catalyze biochemical reactions; like DNA, RNA can form Watson–Crick base pairs with other RNAs or with DNA itself (Figure 2). In other words, RNA is fluent in two languages: the elaborate three-dimensional discourse of proteins and the linear genetic code of DNA. Thus, it seems fitting that RNAs may act as a molecular bridge—an epigenetic “translator”—between chromatin-regulating proteins and the genome sequence. Understanding how noncoding RNAs affect the epigenetic states of cells and organisms will provide us with unprecedented access to the regulatory circuitry that makes multicellular life possible. We approach these fundamental biological questions from both a mechanistic and a systems-level perspective. We combine traditional biochemistry and molecular biology with genome-wide approaches and computational biology and study both conventional systems (mammalian cells) and nonconventional model organisms, such as ants, which offer new, unexplored avenues to study epigenetics (Figure 3). The Bonasio Lab is part of the Department of Cell and Developmental Biology and of the Penn Epigenetics Institute. Zhang Q*, McKenzie NJ*, Warneford-Thomson R*, Gail EH, Flanigan SF, Owen BM, Lauman R, Levina V, Garcia BA, Schittenhelm RB, Bonasio R†, Davidovich C†. : RNA exploits an exposed regulatory site to inhibit the enzymatic activity of PRC2. Nat Struct Mol Biol 26, Mar 2019. Shields EJ, Sheng L, Weiner AK, Garcia BA, Bonasio R: High-Quality Genome Assemblies Reveal Long Non-coding RNAs Expressed in Ant Brains. Cell Reports 23(10): 3078-3090, Jun 2018. Gospocic J, Shields EJ, Glastad KM, Lin Y, Penick CA, Yan H, Mikheyev AS, Linksvayer TA, Garcia BA, Berger SL, Liebig J, Reinberg D, Bonasio R: The Neuropeptide Corazonin Controls Social Behavior and Caste Identity in Ants. Cell 170(4): 748-759.e12, Aug 2017. Yan H, Opachaloemphan C, Mancini G, Yang H, Gallitto M, Mlejnek J, Leibholz A, Haight K, Ghaninia M, Huo L, Perry M, Slone J, Zhou X, Traficante M, Penick CA, Dolezal K, Gokhale K, Stevens K, Fetter-Pruneda I, Bonasio R, Zwiebel LJ, Berger SL, Liebig J, Reinberg D: An Engineered orco Mutation Produces Aberrant Social Behavior and Defective Neural Development in Ants. Cell 170(4): 736-747.e9, Aug 2017. He C, Sidoli S, Warneford-Thomson R, Tatomer DC, Wilusz JE, Garcia BA, Bonasio R: High-resolution mapping of RNA-binding regions in the nuclear proteome of embryonic stem cells. Molecular Cell 64(2): 416–30, Oct 2016. 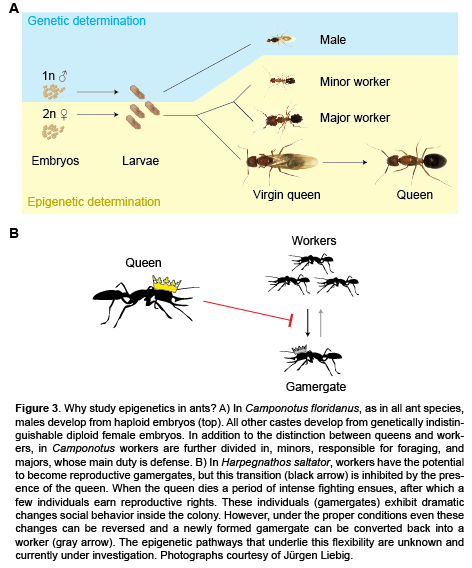 Simola DF, Graham RJ, Brady CM, Enzmann BL, Desplan C, Ray A, Zwiebel LJ, Bonasio R, Reinberg D, Liebig J, Berger SL: Epigenetic (re)programming of caste-specific behavior in the ant Camponotus floridanus. Science 351(6268): aac6633, Jan 2016. Bonasio R, Shiekhattar R: Regulation of transcription by long noncoding RNAs. Annu Rev Genet 48: 433-55, Sep 2014. Bonasio R, Zhang G, Ye C, Mutti NS, Fang X, Qin N, Donahue G, Yang P, Li Q, Li C, Zhang P, Huang Z, Berger SL, Reinberg D, Wang J, Liebig J: Genomic comparison of the ants Camponotus floridanus and Harpegnathos saltator. Science 329(5995): 1068-71, Aug 2010. Kaneko S, Son J, Shen SS, Reinberg D, Bonasio R: PRC2 binds active promoters and contacts nascent RNAs in embryonic stem cells. Nat Struct Mol Biol 20(11): 1258-64, Nov 2013. 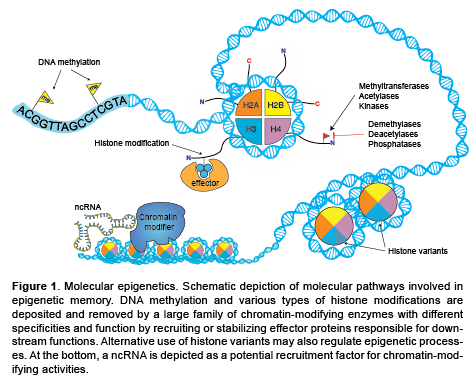 Bonasio R, Tu S, Reinberg D: Molecular signals of epigenetic states. Science 330(6004): 612-6, Oct 2010.